Enriched with vegetable oils, the Gaiia The Silky Vegan Scented Surgras Soap provides the dose of hydration necessary for your skin. Thanks to its artisanal manufacture, this cold soap preserves all the qualities of its natural ingredients. It envelops your skin with a flowery perfume of rosewood delicately raised with a hint of black pepper. 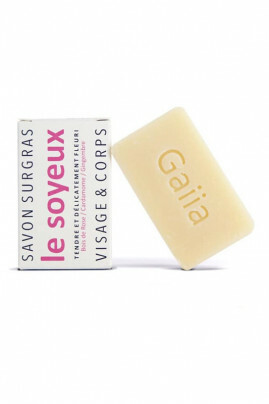 Gaiia The Silky Vegan Scented Surgras Soap gives your skin an incredible softness. Ideal for all skin types! TheGaiia The Silky Vegan Scented Surgras Soap is ecological and biodegradable! True 5 in 1, cold soap can be used as a natural shampoo. It gently cleanses the scalp for clean, soft hair. You can also eliminate all traces of makeup such as a facial cleanser. For men, it will be useful as a shaving soap for shaving. The whole family will adopt it to clean the face and body! A handmade soap made with the method of cold saponification! Sodium Olivate, Sodium Rice Branate, Sodium Cocoate, Aqua, Glycerin, Sodium Castorate, Aniba rosaeodora wood oil, Zingiber officinal root oil, Piper nigrum fruit oil, Linalool, Limonene, Benzyl benzoate, Geraniol.